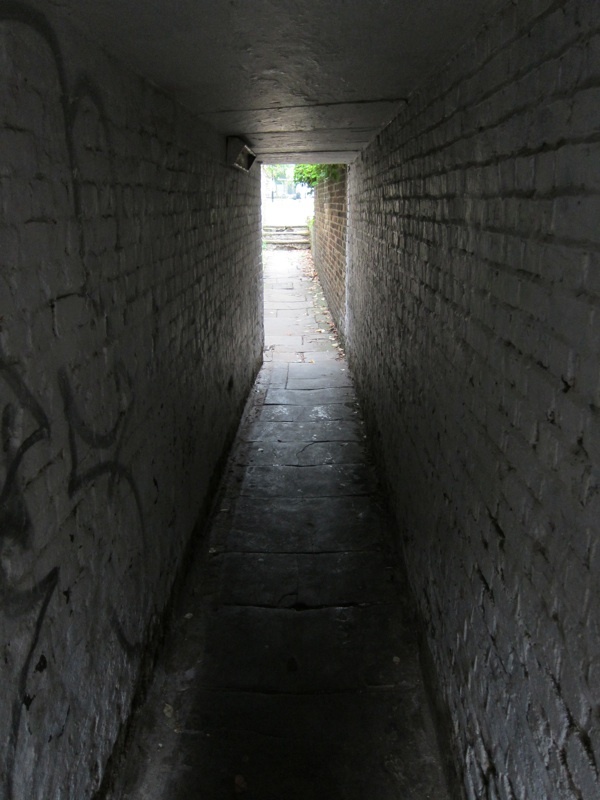 Next time you are walking up Shepherdess Walk in Hoxton and you pass that sinister tunnel with the worn flagstones, leading under the shabby nineteenth century terrace, I recommend you take courage and pass through it to the park at the other end where a wonderful surprise awaits you. 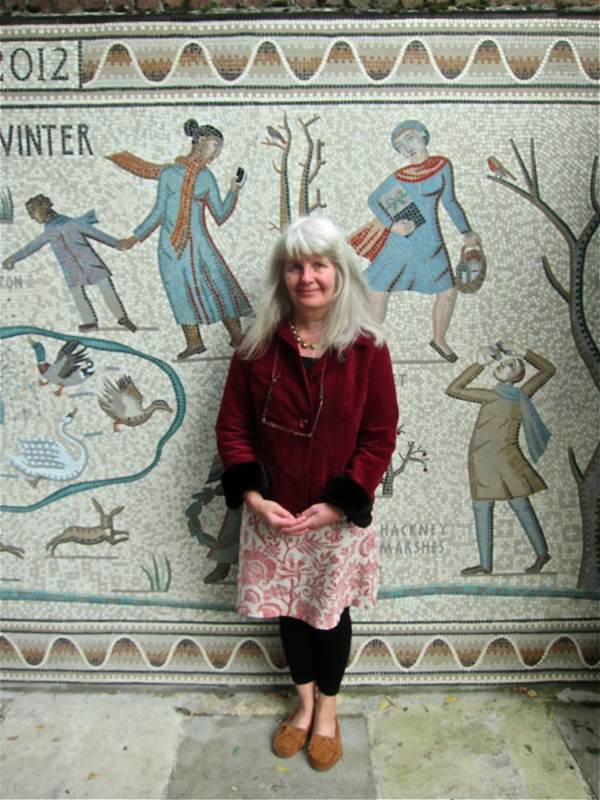 For the last two years, artist Tessa Hunkin and around one hundred and fifty people have been working to create an elaborate set of mosaics in Shepherdess Walk Park, which are inaugurated with a party on Thursday this week. 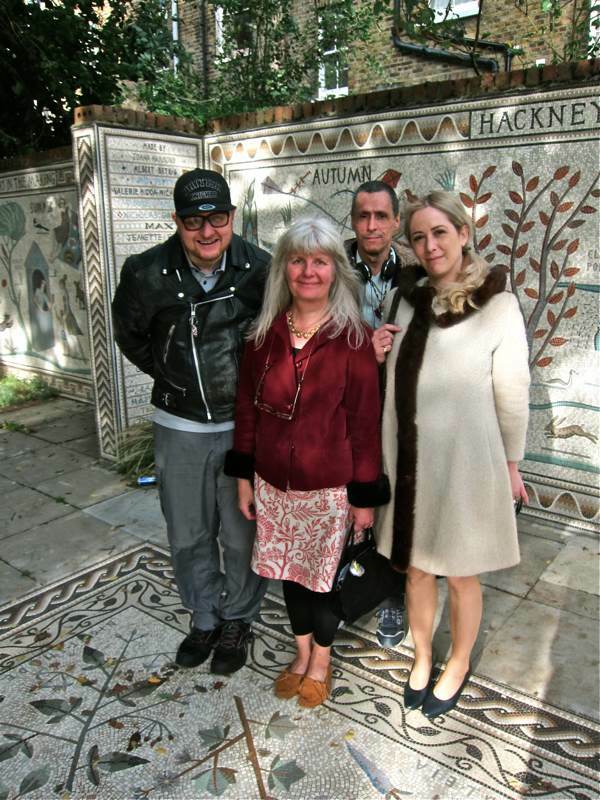 These breathtakingly beautiful pieces of work are destined to become an attraction in their own right – drawing people from far and wide to this corner of Hoxton – but before the crowds arrive, I had the pleasure of going over to admire them in the company of Tessa and couple of the stalwart mosaic makers, as they contemplate the completion of their mighty task which has transformed an unloved part of the park into an inspirational spot. 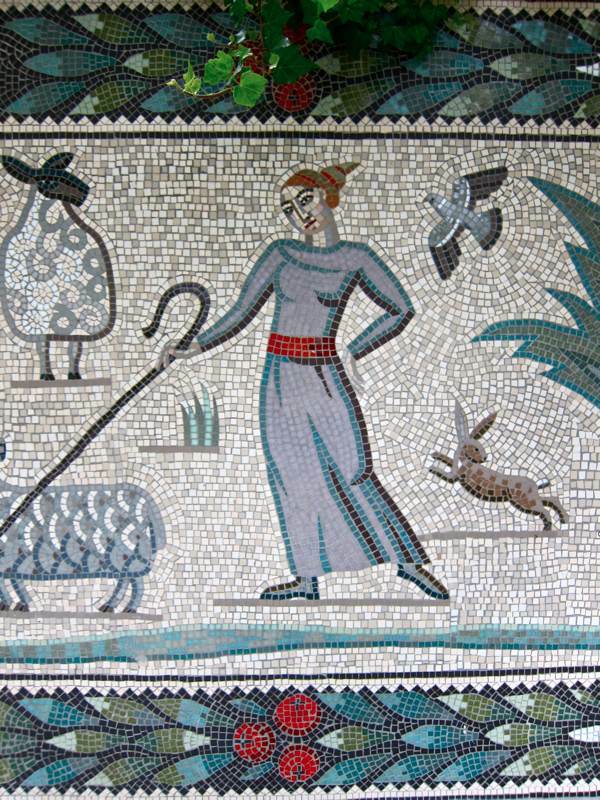 Taking the lyrical name of Shepherdess Walk as a starting point, the first mosaic portrays the shepherdesses that once drove their sheep through here when Hoxton was all fields. 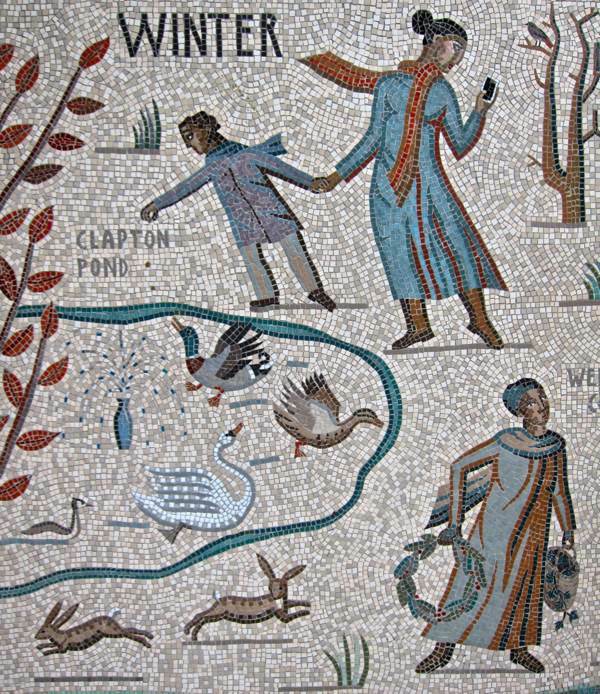 Next to this, a double wall panel illustrates park life throughout the seasons of the year in the East End while, underfoot, a pair of pavement mosaics show the wild flowers that persist, all illustrated in superb botanic detail. 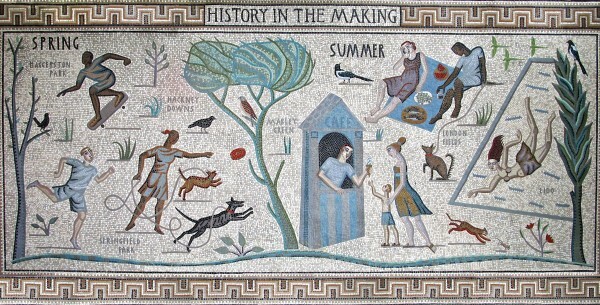 The quality of execution and subtle sense of colour in Tessa Hunkin’s designs combine with humorous observation of the detail of the social and the natural world to create works of lasting value which residents of Hoxton can enjoy for generations to come. 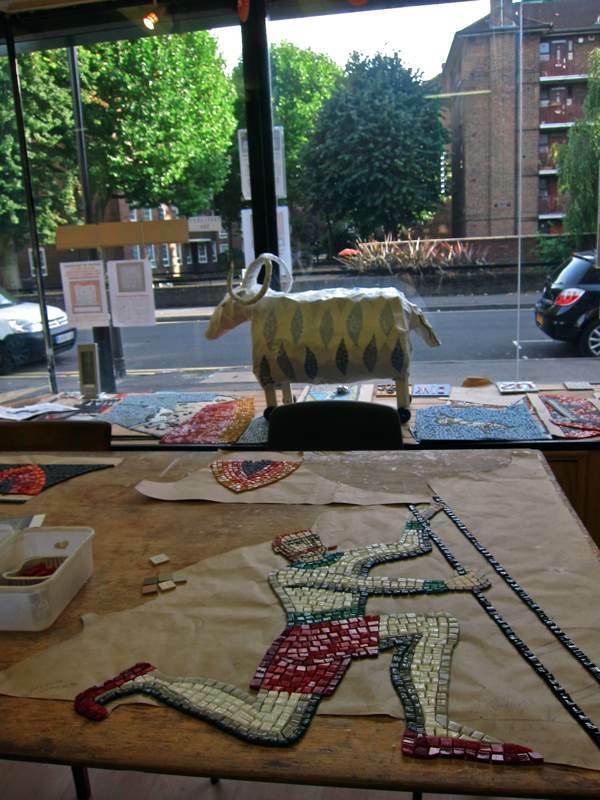 You will pleased to learn that after the success of the Shepherdess Walk mosaics, the team are already working on an ambitious new mosaic for Pitfield St, commemorating the Hoxton Palace of Varieties, and then Tessa and the mosaic makers will be moving to a studio in Hackney Downs to undertake a commission for a children’s playground. “When Tessa showed me the work, I thought it was interesting and I wanted to try but, originally, it was only going to be until the end of the year and now I’ve been here two years. I live in Stratford, two bus rides away, but I come two or three times a week. It’s always different here, so I never get bored. I worked on the borders, and I get satisfaction and self-esteem from doing this work. 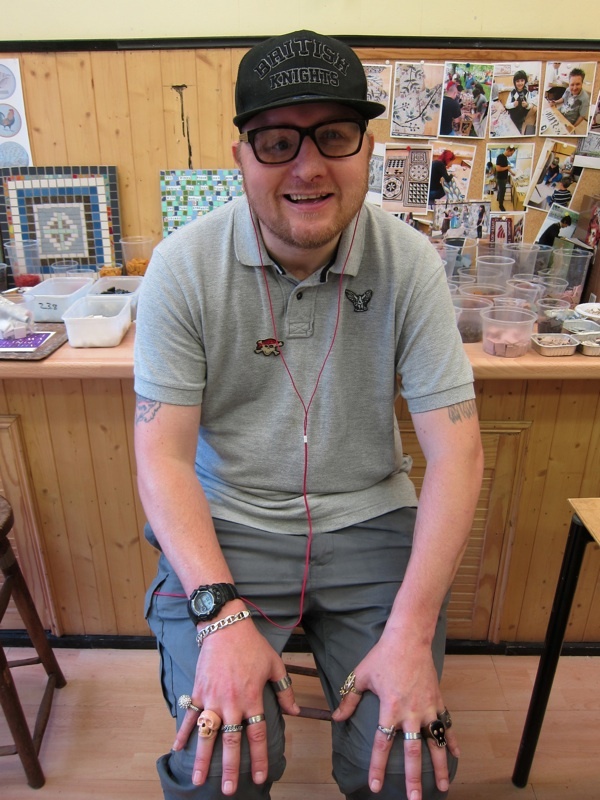 Nicky shows off his rings. The old tunnel from Shepherdess Walk that leads to the mosaics in the park. 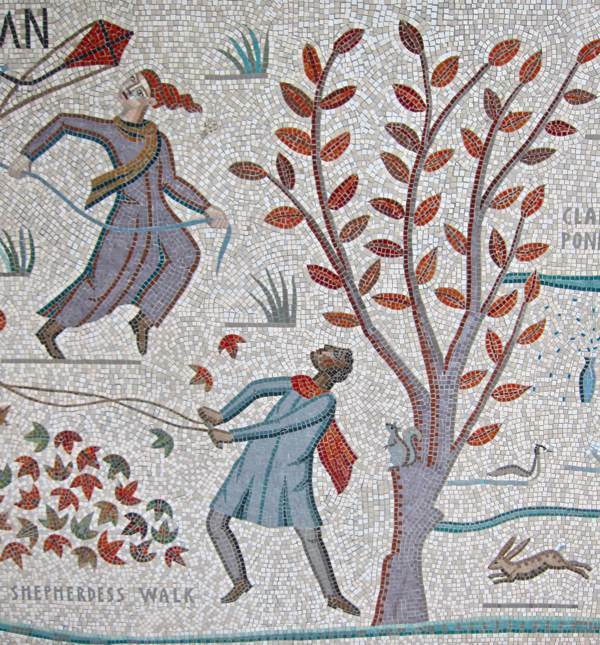 All are welcome at the unveiling of the mosaics in Shepherdess Walk Park on Thursday 10th October at 3pm, preceded by refreshments from 2pm at the Community Hall on Murray Grove, Hoxton. Just lovely, the concept, and most especially the artwork!!! oh! fabulous post and beautiful story and work! will definitely be looking for these next time i’m in london. Fantastic! A tip of the hat to you all, from Los Angeles…. Positively beautiful! Amazing work, dedication and talent by all involved. so beautifully laid and designed, congrats to one and all. i love the rabbit, the woman with the iphone, all the birds and borders. glory be to god for dappled things…. Superb. They’re going on my ‘interesting things to visit’ list. 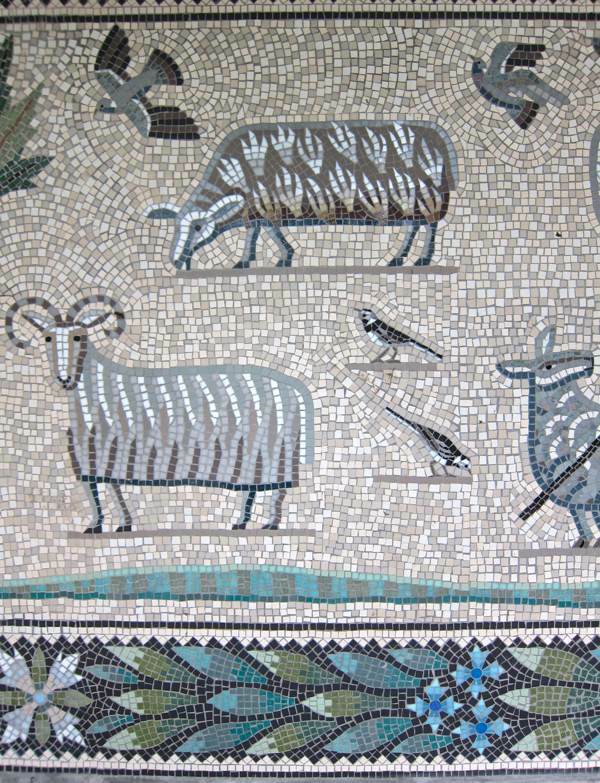 These mosaics are magnificent and they are very pleasing to the eye. So good that it brings therapy to the individuals and the collective. What a marvelous way to bring a bit of peace to oneself and pleasure to others. Brilliant. 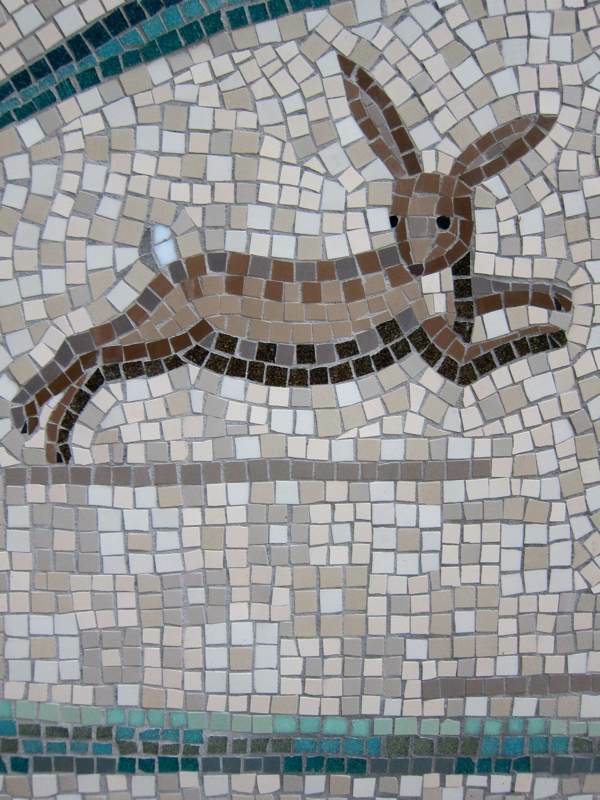 I’m amazed at the beauty of these mosaics, love them, definitely off to see them as soon as possible. Congratulations to Tessa and the team! A wondrous project, finely done. Looking forward to seeing it. Absolutely blown away by such a wonderful piece of work. The dedication of the people involved over such a long time is impressive and they should be very proud of themselves. 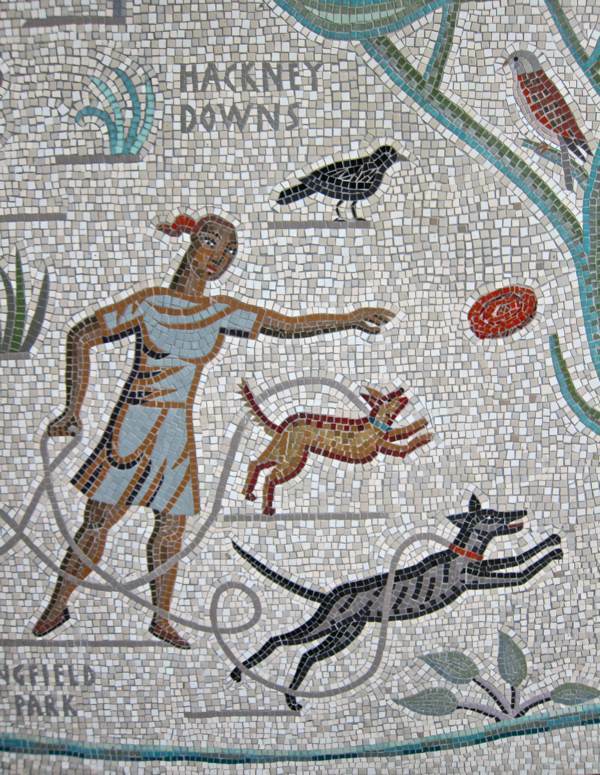 I live 250 miles away but am inspired to travel to London in the near future to see this marvellous mosaic. This is inspirational and so beautiful. I do hope the weather is kind for the unveiling on 10th! Huge congratulations to Tessa and her team. I was in Pompeii earlier this year and these works absolutely stand comparison. A really welcome addition to the East London landscape. Thank you. 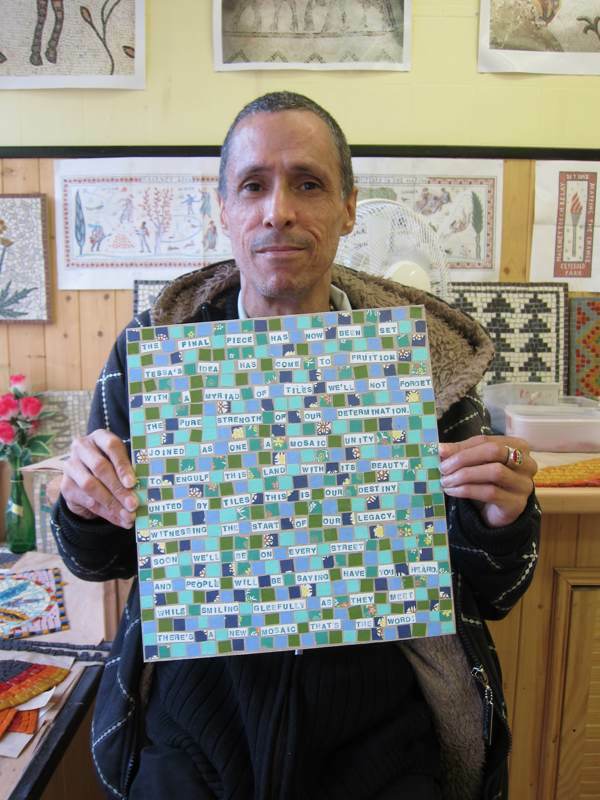 Absolutely beautiful and quite uplifting: what a marvellous set of mosaic art – and how pleasing to have a hand in contributing something so worthwhile to your surroundings for the benefit of all. Stunningly beautiful, an Inner-City community, created from scratch, all working towards an artistic and lasting creation. 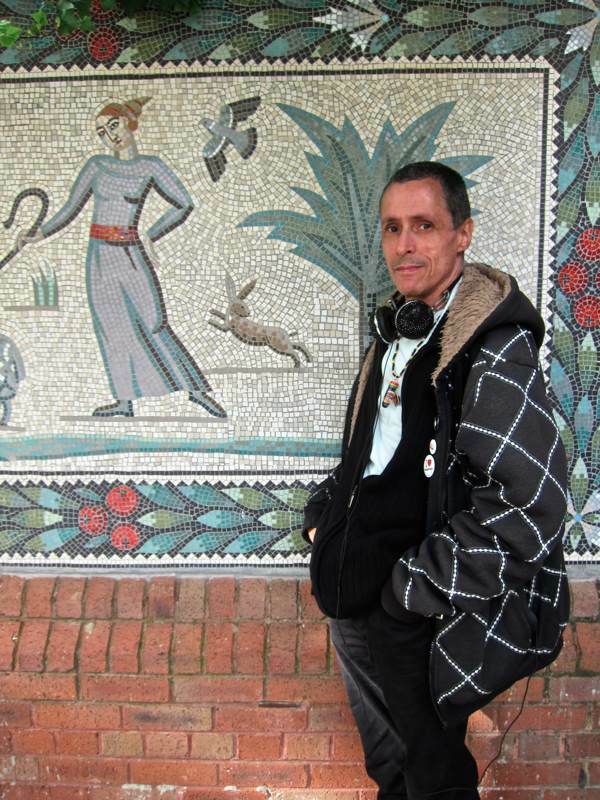 The mosaics are absolutely stunning pieces of work, and the project itself is so inspirational! I’ll definitely be seeking these out next time I’m in London. Congratulations and thank you to all concerned. Lovely article and great photos. 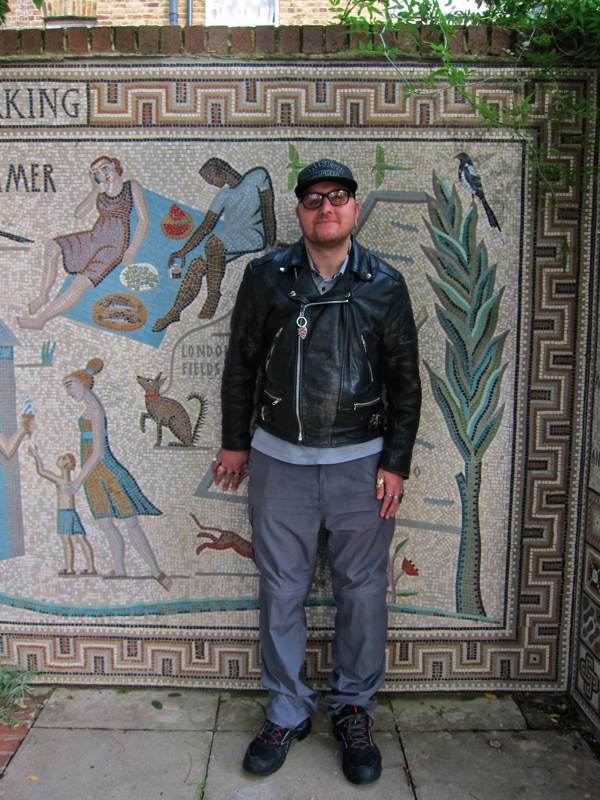 I’ll see you on Thursday, lets hope the sun shines on every tile! WOW! What a lot of hard work. 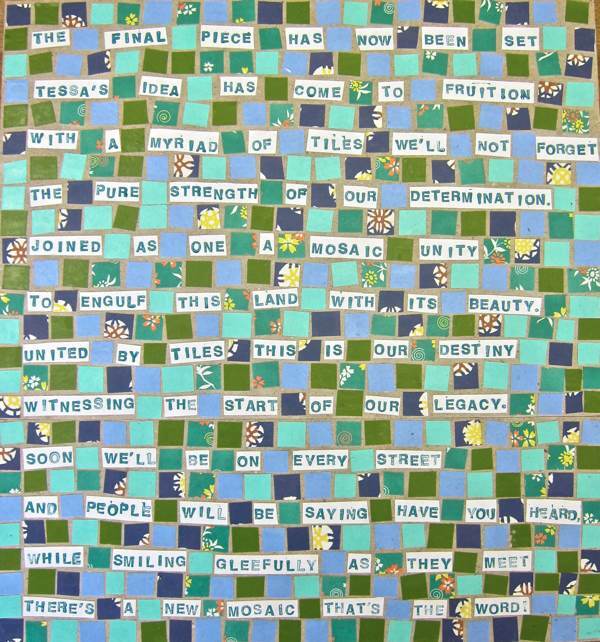 I once did a mosaic for my small garden table. It took forever. I don’t know if I would have the patience for this much. It’s very beautiful work. I can’t wait to see it the next time I am in London. Congratulations! You should all be very proud! Glorious!!! Heart-warming, inspiring, community-building, healing, and BEAUTIFUL and charming to boot!! I’m in awe. Just when you thought London could not be more beautiful, along came these folks. Can’t help but think there is a “London Cries” wanting somewhere. Thank you, Artisans. Thank you Gentle Author. Happened upon this inspiring and amazing community effort, took the chill off a fall day in Alaska. Very beautiful. Congratulations to all involved! How wonderful they are an amazing project! Well, what can I say that has not been said already in the previous comments? It is absolutely amazing and what a great way to make the world a better place. I like the cat and the mouse best! Thanks for blogging about it. Absolutely beautiful. The lapwings, the wagtails, the great-crested grebe! The detail and level of accomplishment is wonderful. 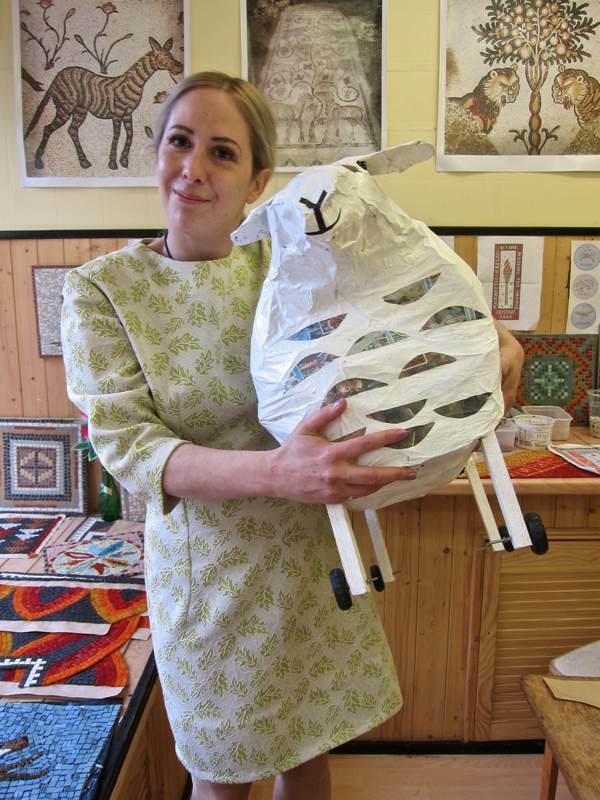 What a lovely story and fantastic project. Can’t wait to see them in real life. Such beautiful colours. I’m on my way to see them! Beautiful design. The graceful movement of all the figures is exquisite! Congratulations from Alabama, USA. 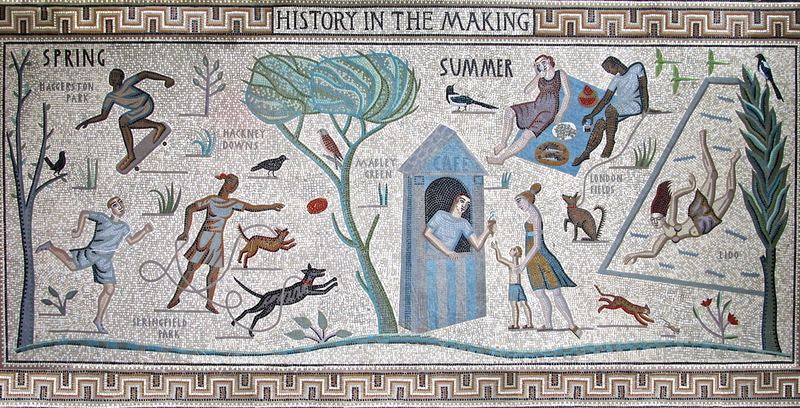 I wish I lived near your lovely park with its lovely mosaics. Enjoy! 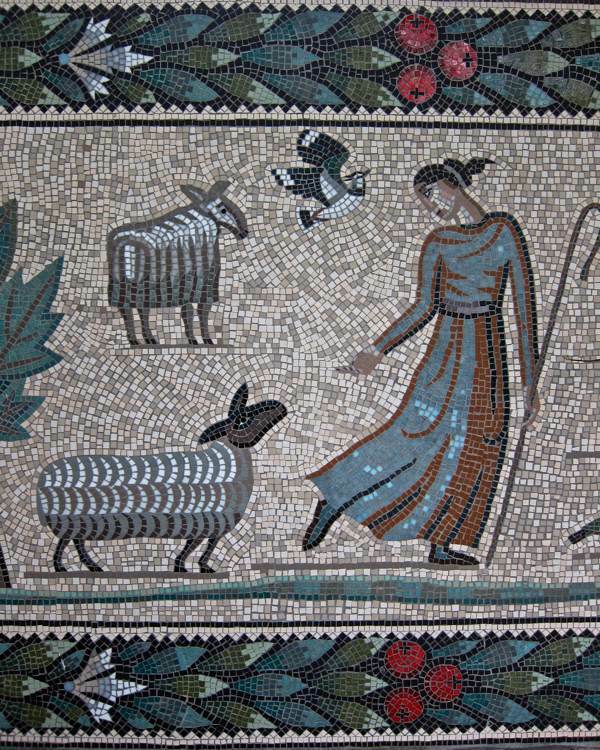 I was really moved to read about these wonderful mosaics and to see them and some of the people who made them, too. 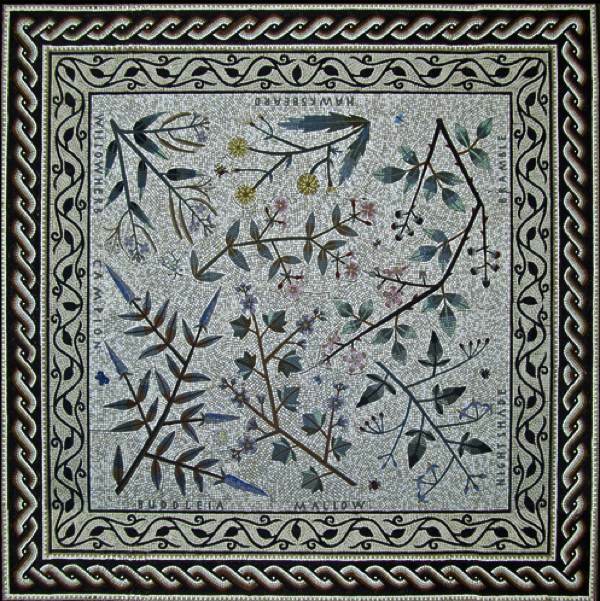 Mosaics are an exquisite art-form, one that I love from the ancient world – these new mosaics are worthy successors to the best of Roman mosaics, for instance. 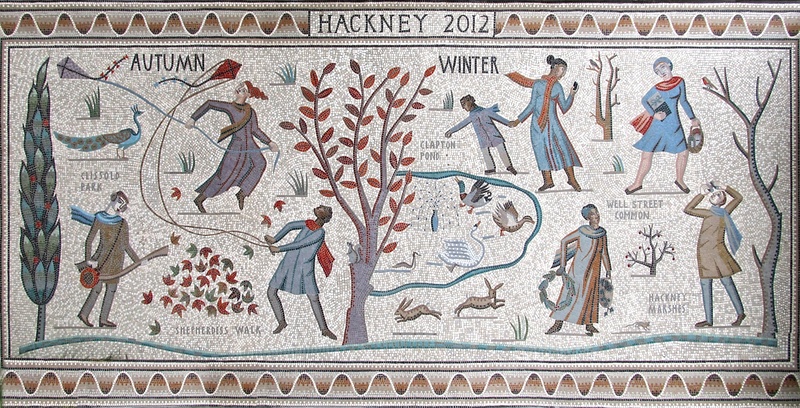 The Hoxton mosaics are beautifully designed and executed and I look forward to seeing them for real. It is great that their making was a collective effort – those who did so must have had great fun and companionship working on them, and now, well-deserved pride in their beauty now that they are finished. They can also be assured that their painstaking work will bring immense pleasure to many Londoners, young and old. These are so wonderful I’ve come back for another look! What a magnificent story!! Ken’s verse is superb and the line – “the pure strength of our determination” explains the power each of these Londoners has found. Wow!! These are just wonderful – huge credit toTessa and her collaborators. 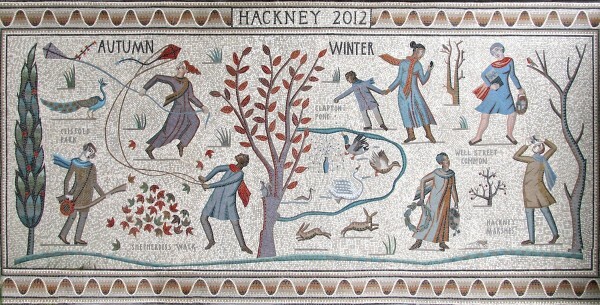 I lived in Hackney and Islington for many years and have such memories and feelings for all the places in the mosaics. Truly beautiful, and may they last as long as the mosaics in Istanbul. I shall make sure I see them next time I’m in London. of this around our streets,not only east london it would help to lift everyone. This is truly wonderful work. It is inspiring to see any work, in any discipline, which manages to be truly TRADITIONAL — careless thinkers associate this with “old-fashioned” ways; and at least partially, they’re right: for to be truly traditional, work must in fact be connected to what has been done before both in technique and, most likely, matter. But if it is not living in the present, and capable of growing within its own tradition…it’s not traditional: it’s DEAD. 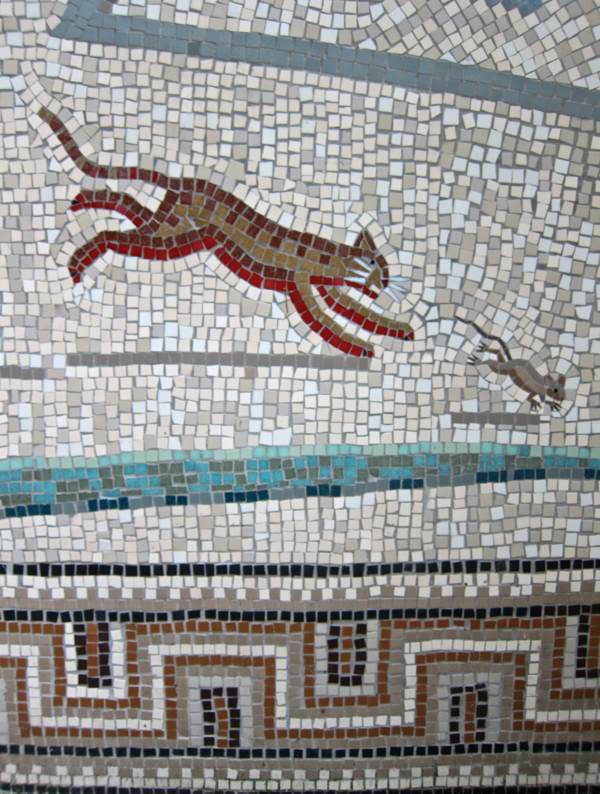 Which is why it’s such a joy to see these mosaics. 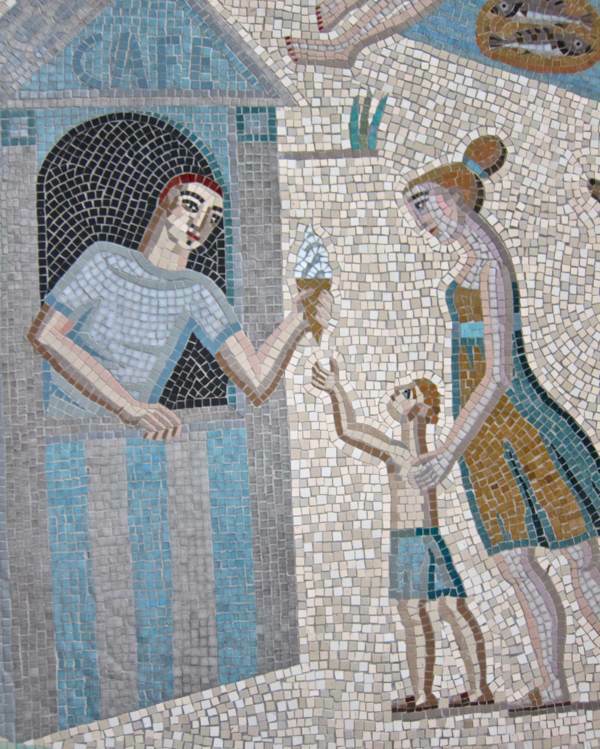 They can assuredly be enjoyed without knowing anything about the history of mosaics…but for those who do know a bit…here is something entirely modern, speaking of our own day, which is also fully alive with the spirit and forms of a great period of the art it is carried out in. 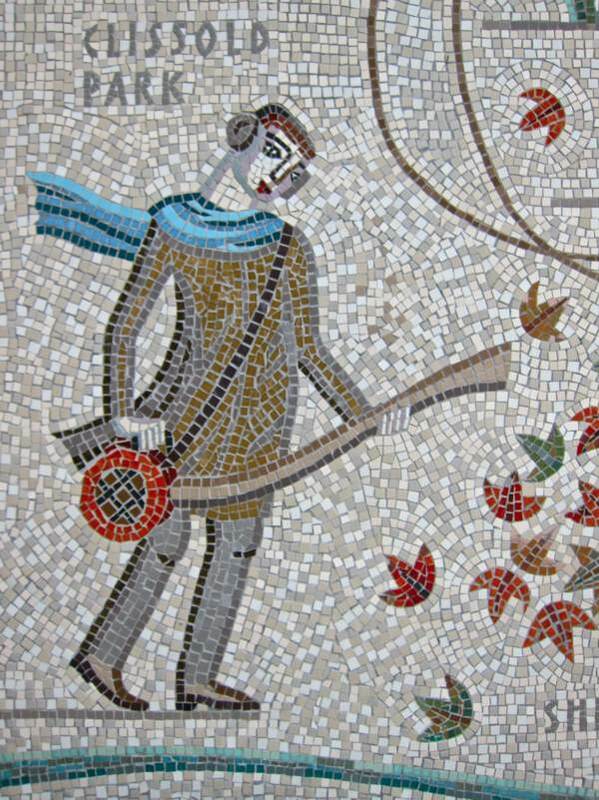 There is nothing twee or stilted; the modern matter wears its 3rd and 4th century “clothing” entirely naturally — and I think when these mosaics are looked at in a couple of thousand years (as we look at the Carthaginian or Sicilian ones now) it will be the iPhones and leaf blowers that will look old-fashioned, not the artistic style. That is as fresh and new as it was two milennia ago, and as any good style can be, when handled as elegantly as this has been. Congratulations to all concerned! I am coming to the Metropolis in a few weeks from my home in Boston, US, and will be sure to visit this lovely work. Wonderful. I love the marriage between classical & modern – witty, clever and sweetly tender. Congratulations to everyone involved. I keep coming back to the photos for another look. I’ll look forward to future projects. Thank you! I lived just across the road from the creepy tunnle from a baby in 1950 to 1966. On my next visit to the area I will take a closer look. wow, amazing mozaics!! can’t believe the amount of patience and dedication these artists have. Hoxton is turning out to be a great neighbourhood, I love the little bars and cafes along the canal, and some great developments too!